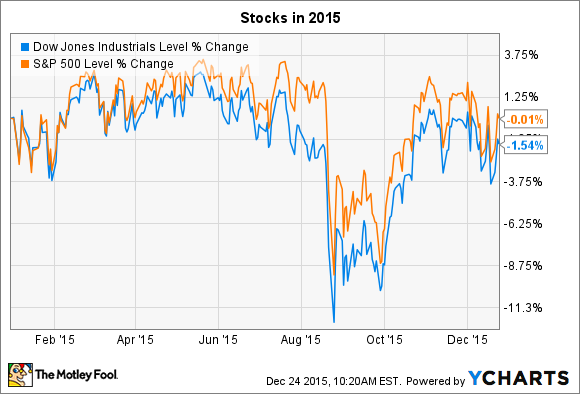 Can the market’s two best-performing stocks keep climbing into 2016? If all you did was check your portfolio once at the beginning of the year, and once more at the end, you'd likely conclude that 2015 was calm -- even boring -- for stocks. But that's not at all how it went down. Investors witnessed an historic collapse in commodity prices this year, as oil dove from $55 per barrel to below $40. We saw economic turmoil in emerging markets including Ukraine, Russia, Venezuela, and Brazil, and unprecedented foreign currency swings against the U.S. dollar. Oh, and the Federal Reserve boosted interest rates for the first time in almost a decade. Yet through all of that, the S&P 500 (SNPINDEX:^GSPC) is sitting roughly where it began the year. Heading into the last four trading days, it's as close to flat as you can get. The Dow Jones Industrial Average (DJINDICES:^DJI) has slipped lower by only 2%. Of course, shareholders of individual stocks fared much better, or much worse, than that broad market average. So with the year wrapping up, let's take a look at the leaders of 2015 -- the two best-performing stocks on the S&P 500 -- with an eye toward what investors should watch as these businesses close out their biggest fiscal quarters. Streaming video giant Netflix (NASDAQ:NFLX) got an assist in climbing this year's leaderboard: Shareholders were so spooked by its final quarterly report of 2014 that the stock lost 25% of its value in the three months prior to Jan. 1. Original content was some of the company's most-efficient programming. Uptake in international markets was proving stronger than management expected. These developments underpinned Netflix's impressive transition this year into an exclusive content powerhouse with near-global reach. For the quarter that closes this week, CEO Reed Hastings and his executive team have projected adding 5.15 million new members around the world -- as all of those gifted TVs, tablets, and video game consoles come online -- for its biggest period of the year, by far. Investors should also get important updates on the year ahead. Netflix has said that it plans to complete its global expansion in 2016, and thus begin generating substantial operating profits in 2017 and beyond. It makes sense, in retrospect, that Amazon.com (NASDAQ:AMZN) performed well this year. After all, the growth of e-commerce has been a major theme of 2015, causing huge headaches for traditional retailers from department store chains to big-box stores. Yet Amazon has only increased its dominant lead in online selling this year: Its order volume was up 24% in the week following Thanksgiving Day, according to market research firm ChannelAdvisor, compared to 21% for the broader industry. CEO Jeff Bezos projected in late October that Amazon's sales would grow by anywhere from 14% to 25% for the quarter that closes this week. Wall Street is on the optimistic end of that outlook: Consensus estimates call for a 23% improvement to $36 billion of revenue. Investors will be keen to see if real profits flow from those hefty sales gains. Amazon hasn't prioritized earnings growth since its founding, choosing, instead, to focus on cash flow. Yet with Amazon's cloud-services business generating strong profits, and with much of its capital expansion growth behind it, it's possible that Bezos and his team could see significant income accumulate in the year ahead.